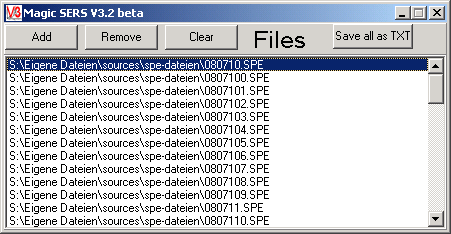 A program for fast Viewing of spectras in txt, spe or thd format, the pictures can be saved. It is possible to search for Peaks and combine spectra to series. Supported Datatypes: SPE Winpec Spectra, THD Timeharp Picoquant, Chr(#9) seperated TXT data. Configuration of x,y-axis (y-axis automaticly set to logarithmic for THD). 01.03.2009 Added Spectra Scan (form an Intensity images out of Spectra) free choice of size and area of the Spectra used for the Picture save as STP for WSxM, click into the Picture shows the Spectrum at this point. 20.04.2008 Bugfixing, Properties for THD-Files added. 19.02.2007 Switch for logarithmic scale for y-Axis (for THD-files automatical on, for SPE off, TXT use the last setting). Preferenceswindow for "Save all as Text" added, for future extension, at the moment only the 3 lines header can be turned off. 10.12.2006 reads THD (Timeharp-Picoquant) files, still BETA! some small bugs removed related to spectra series. 20.11.2005 With Ctrl+T the Data can be copied as text to clipboard for use in programs like Origin or Qtiplot. Some small bugs removed with large Datafiles. Updatecheck included. new structure in Source code. 30.09.2005 Change of scale-type possible (Pixel/wavelength/wavenumbers/rel. wavenumbers/Original) for SPE-files. Bug with Windows XP removed: first file at "Save all as text" the '\' was not there. Some translation changed. Picture possible to copy: Ctrl+C Bitmap, Strg+X als EMF (advantage: free scaleable).